Enjoy your sandwich made just the way you like it. Discover our variety of fresh vegetables and the deliciousness of our breads, cheese and sauces. Please note, product availability may vary depending on location. Check your local Subway® Restaurant for other varieties of breads, toppings and sauces that may be available. Baked fresh daily and available in 6-inch and Footlong sizes. Nothing compares to our delicious lineup of cheeses, sauces and veggies. Check them all out! Choosing all the fresh veggies Subway® restaurants offer provides 2 daily servings of vegetables per 6-inch sandwich. 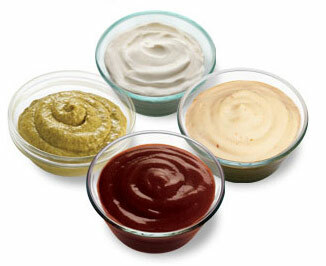 Finish off your sandwich or salad with one of our delicious sauces.